We know Joseph was a compassionate, caring man. When he discovered Mary was pregnant after they had been betrothed, he knew the child was not his but was as yet unaware that she was carrying the Son of God. He knew women accused of adultery could be stoned to death, so he resolved to send her away quietly to not expose her to shame or cruelty. However, when an angel came to Joseph in a dream and told him, 20 “Joseph son of David, do not be afraid to take Mary home as your wife, because what is conceived in her is from the Holy Spirit. 21 She will give birth to a son, and you are to give him the name Jesus, because he will save his people from their sins,” he did as the angel told him and took Mary as his wife. (Matthew 1:19-25). According to the Catholic Encyclopedia, the Apocryphal Date for Joseph’s birth is 90 BC in Bethlehem and the Apocryphal Date of his death is July 20, AD 18 in Nazareth. Joseph is the patron saint of the dying because, assuming he died before Jesus’ public life, he died with Jesus and Mary close to him, the way we all would like to leave this earth. We celebrate two feast days for Joseph: March 19 for Joseph the Husband of Mary and May 1 for Joseph the Worker. March 19 has been the most commonly celebrated feast day for Joseph, and it wasn’t until 1955 that Pope Pius XII established the Feast of “St. Joseph the Worker” to be celebrated on May 1. This is also May Day (International Workers’ Day) and believed to reflect Joseph’s status as the patron of workers. 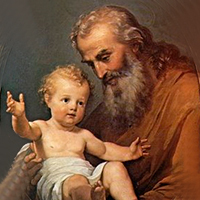 In art, Joseph is typically portrayed as an older man, with grey hair and a beard, often balding, sometimes appearing frail and a marginal figure next to Mary and Jesus, if not entirely in the background. Some statues of Joseph show his staff topped with flowers. St. Joseph is shown with the attributes of a carpenter’s square or tools, the infant Jesus, his lily blossomed staff, two turtle doves, or a spikenard. There is much we still wish we could know about Joseph — exactly where and when he was born, how he spent his days, exactly when and how he died. But Scripture has left us with the most important knowledge: who he was — “a righteous man” (Matthew 1:18).